SBTET-AP EXAMINATION NOTIFICATION OF CCIC,LSUR AND SHORT TERM COURSES OF FEB/MAR-2017.To Download the official Notification open the following link. 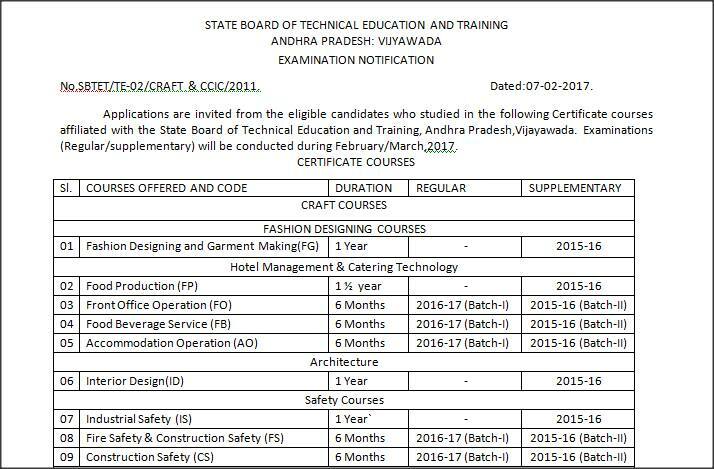 Applications are invited from the eligible candidates who studied in the following Certificate courses affiliated with the State Board of Technical Education and Training, Andhra Pradesh,Vijayawada. Examinations (Regular/supplementary) will be conducted during February/March,2017. 1. Applicants of CCIC Courses admitted in 2016-17Academic Years are only eligible to appear for the above examinations and have to appear for only one course for one time as there is no Supplementary examination for the above course. Details of submission of online application along with dates and instructions for filing of online application and mode of payment of CCIC and Short term courses examinations to be held during February/March,2017 will be placed in the sbtet website i.e.http://sbtetap.gov.in. Commencement of uploading of online application. 1. The candidates belongs to Andhra Pradesh have to file the application with URL http://apsbtet.net/ccicportalwithout spelling mistakes. 4. The Principals of Land Surveying, Computer Certificate Courses and Short Term Courses should send the list of the Nominal Rolls of the candidates of the respective institutions along with the filled in application forms duly attested xerox copies of requisite qualifications and affiliation order of the Institute in the named cover to Sri A.NirmalkumarPriya, Secretary (FAC),, State Board of Technical Education and Training, Andhra Pradesh, Government Polytechnic for Women Campus, Opp:Maruthi Nagar Arch, Beside:WaterTanki, Chowdarypet, Gujjanagulla, Guntur-522006 before the last date of submission of application as per schedule. 6. 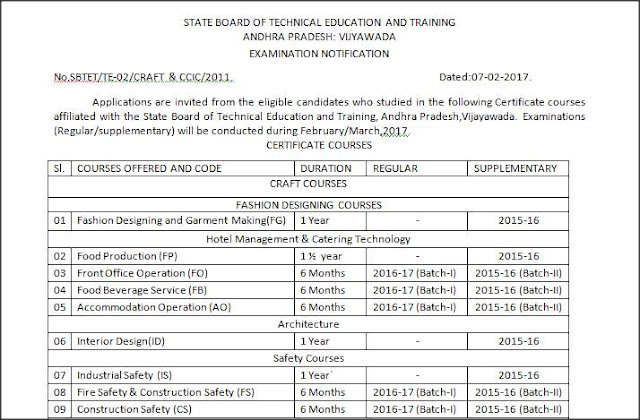 Necessary Xerox copies of educational qualifications of the candidate duly attested by the Principal concerned should be enclosed with the downloaded online application and shall be submitted directly to the State Board of Technical Education and Training,Andhra Pradesh, Government Polytechnic for Women Campus, Opp:Maruthi Nagar Arch, Beside:WaterTanki, Chowdarypet, Gujjanagulla, Guntur-522006 within the stipulated time. 12. After submitting the online application, for correction of spelling mistakes in the name father’s name and Date of Birth and change of photograph, the candidate/principal may send email with details to the sbtet website i.e.systemanalyst.apsbtet@gmail.combefore last date of submission of online application. 13. Theory Examinations will be conducted during the period February/March,2017 and the Examination Time Table will beplaced in the sbtetwebsite http://apsbtet.net/ccicportal. Further, it is informed to keep on watch the same website for in case of any changes in the Examination Schedule. 14. Hall Tickets will be downloaded from the above portal in which the candidates filed their application online before one week of the commencement of theory examinations. Once Hall Ticket is generated, no correction will be made.